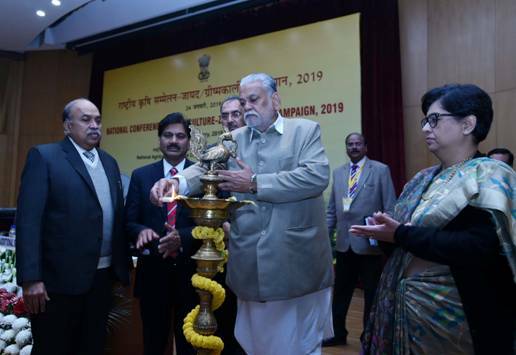 National Conference on Agriculture for Zaid Campaign-2019 was organized by the Ministry of Agriculture & Farmers Welfare in New Delhi on Thursday in which the Minister of State for Agriculture Parshottam Rupala highlighted the achievements made by the Ministry in the last 4 years. Speaking on the occasion Rupala said that today about 45% of the land has been covered under irrigation. Empirical evidences suggest that assured or protective irrigation encourages farmers to invest more in farming technology and inputs leading to productivity enhancement and increased farm income, he underlined. Talking about Pradhan Mantri Krishi Sinchayee Yojana (PMKSY) , Rupala said that its objective is to achieve convergence of investments in irrigation at the field level, expand cultivable area under assured irrigation, improve on-farm water use efficiency to reduce wastage of water, enhance the adoption of precision-irrigation and other water saving technologies, enhance recharge of aquifers and introduce sustainable water conservation practices. Rupala said that as per the 4th Advance Estimates total food grain production in the country is estimated at 284.83 million tonnes in 2017-18 which is higher by 9.72 million tonnes than the previous year. It is also higher by 24.66 million tonnes than the previous five years’ (2012-13 to 2016-17) average production of food grain, he stated. Rupala also mentioned about computerization of Primary Agricultural Credit Societies, among other things aimed at revolutionizing the farm sector. The Conference discussed many issues that have become increasingly relevant. Special sessions with presentations were held to discuss strategy for potential crops and production systems for zaid, irrigation potential for zaid season and achieving water use efficiency through PMKSY, protection of zaid crops from open grazing/stray animals, promotion of organic farming and procurement, price realization and postharvest management. The Secretary, Mr Sanjay Aggarwal urged the states to submit action plan for Zaid and summer season area coverage and stated that summer rice should be discouraged and less water demanding crops like pulses, oilseeds and millets should be promoted during this season. Aggarwal listed the benefits of schemes such as Targeting Rice Fallow Area (TRFA), additional area coverage program under NFSM, inter cropping in sugarcane and oil palm under NFSM. He also said irrigation and nutrient management should be addressed together through Per Drop More Crop of PMKSY. Crop protection methods such as physical barriers, biological barriers, bio-acoustics, bio-fencing and community fodder blocks practices should be promoted by states and help can be sought under RKVY and MNREGA programs, he added.